The centre of balance in the global economy has shifted east. While the USA (for the time being) consumes the most oil, China has emerged as the biggest importer. It is also the world’s largest coal and renewable electricity consumer. The reason, in short, is that since the 1980s, western governments have sat on their hands while the manufacturing industries that their economies were built on moved east; primarily to China. The thinking was that since world trade was conducted primarily in dollars – with the euro, pound and yen as back-up currencies – China would have no choice but to exchange the goods it manufactured for the globally convertible fiat currency conjured out of thin air by western central banks. In effect, Britain, Europe, Japan and the USA traded currency for goods. This had the “benefit” of dramatically lowering the price of goods while simultaneously crushing labour unions and workers’ wages; allowing the debt-based western economies to continue to grow prior to 2008. Things have changed since then; and the pace of change has been increasing recently. That China might have had long-term plans of its own seems not to have penetrated the consciousness of western policy makers. However, as with all developing states, China’s ultimate aim was always to become first a developed state and second a leading state. It is symbolic that in 2017, as Donald Trump and the Republicans turned their attention inward in a vain attempt to “make America great again,” Xi Jinping secured his position as Chinese leader and used it to announce China’s ambition to be a global leader. It is also clear that China intends to bring an end to the petrodollar system based on the 1974 USA-Saudi Arabia agreement to oblige the world to trade oil in US dollars – the means by which the USA has enjoyed “reserve currency” status. “While the heads of Western governments and financial organisations were firefighting the unexpected result of Britain’s Brexit referendum last weekend, a much greater threat to Western economies was occurring on the other side of the planet. This is an aspect of peak oil that often goes under the radar because of the tendency to focus solely on supply. Since geologists were the first to warn about peak oil – the point at which the world reaches maximum oil production – they tended to present the problem as one of falling supplies once oil fields began to deplete; often expressed as a simple bell curve. This, however, ignored economic and geopolitical factors. The economics of oil are mediated by price. As production peaks, prices spike upward. One result of this is that investment in more expensive, smaller and harder to reach deposits become viable (although only insofar as they do not trigger recessions). The US shale boom can be seen in this light – the shale deposits had been discovered decades ago, but only became viable when oil prices spiked above $100 per barrel in 2010. In effect, a proportion of the remaining oil on the back side of the bell curve is brought forward to maintain production growth. 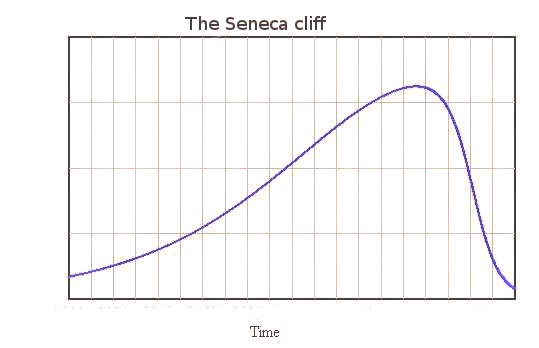 This results in a Seneca effect in which production falls dramatically once a peak is finally reached. Geopolitics adds another dimension to the peak oil story because oil production does not fall evenly around the planet. America’s conventional oil fields peaked in the early 1970s. The North Sea peaked in 1999. Secrecy obscures when Saudi Arabia’s oil fields will peak (assuming they haven’t already) but the development of offshore oil deposits is an indication that Saudi Arabia’s peak cannot be far away. Similarly, the full extent of Russia’s oil reserves is not known, although a peak in conventional production is not far away. As the world reaches a peak, the key question will be who gets access to the oil that remains… and at what price? “Europe’s set to be stuck with a higher oil bill as Russia shifts more of its supply to the Chinese oil market. The inevitable result will be economy-busting oil price rises across Europe, as states are obliged to compete for whatever oil remains for sale on the open market. This said, the immediate impact is likely to be felt in the wider economy as consumption crashes and fiat currencies devalue. The US position is likely to be more nuanced, since it continues to produce a high volume of oil of its own, and may also draw on imports from Canada, Mexico and Venuzuela. This said, the shock to the USA may prove even more devastating than in Europe since Americans are far more dependent upon road transport than are Europeans (who enjoy walkable cities and better public transport systems). The point of peak oil is not that states will run out of oil, only that they will have to get by with less. Exactly how much less will be determined not by the amount of oil in the ground, but by how much of what remains is available for non-oil states to import. If, as looks likely, China is able to use bilateral deals and trade in Yuan to corner a large part of the oil market, then Europe and the USA may soon face oil shortages of the kind last seen in the early 1970s… only this time they won’t be going away.